January Black Sixteen-year-old genius Matty Ducayn has never fit in on The Hill, an ordered place seriously lacking a sense of humor. After his school’s headmaster expels him for a small act of mischief, Matty’s future looks grim until King Hadrian comes to his rescue with a challenge: answer a question for a master’s diploma. More than a second chance, this means freedom. Masters can choose where they work, a rarity among Regents, and the question is simple. What was January Black? It’s a ship. Everyone knows that. Hadrian rejects that answer, though, and Matty becomes compelled by curiosity and pride to solve the puzzle. When his search for an answer turns up long-buried state secrets, Matty’s journey becomes a collision course with a deadly royal decree. He's been set up to fail, which forces him to choose. Run for his life with the challenge lost...or call the king’s bluff. Author Wendy S. Russo Wendy S. Russo got her start writing in the sixth grade. That story involved a talisman with crystals that had to be found and assembled before bad things happened, and dialog that read like classroom roll call. Since then, she’s majored in journalism (for one semester), published poetry, taken a course on short novels, and watched most everything ever filmed by Quentin Tarantino. 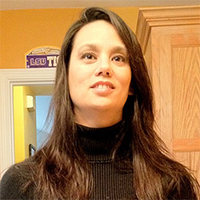 A Wyoming native transplanted in Baton Rouge, Wendy works for Louisiana State University as an IT analyst. She’s a wife, a mom, a Tiger, a Who Dat, and she falls asleep on her couch at 8:30 on weeknights. 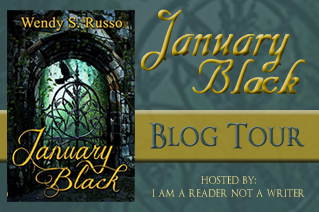 I'm lucky enough to have Wendy S. Russo, author of January Black posting on my blog today about her writing process. Take it away, Wendy! My writing process has evolved over the years. In high school, I always had a notebook and a pencil, ready to jot down lists of characters, with ages, that I thought would make a good story. In college, I started writing Star Wars fan fiction scenes (a very good way to start writing novels, if you’ve always wanted to.) These scenes started to connect, and a few years later, I had a trilogy of Star Wars fanfic novels. At that point, I moved onto an idea of my own. I typed like a blizzard for ten months and ended up with a two-volume, 300k word epic fantasy. I was a pantser, straight up, until I took a college course on Short Novel Writing. I learned about novel types and structures, deus ex machinaand suspension of disbelief. I saw grotesque flaws in my epic and decided to fix it. Ten years passed. I had sixty thousand words when I shelved it. I loved it, but I recognized that it was the introduction to something massive. Song of Ice and Fire massive. I wasn’t committed to researching everything that would have been required to bring my new world alive. Now it’s a junk yard that I cannibalize to create other stories. January Black is from that junk yard. My new WIPs “Nick Jackson’s Error” and “The Choir Boys” will cherry pick from the wreckage as well. I’m more of a plotter now than a pantser. I like puzzles, and in storytelling is like a jigsaw puzzle, except that I have to create the pieces. And until March of this year, I’ve been building those pieces mostly in my head. I jot down notes and bits of scenes that I save in Scrivener draft folders. I listen to music as a write, and songs have influenced directions my stories have gone. I’ve collected pictures of character models, but that’s as far as I’ve ever really gone into visual research. What happened in March? Glad you asked. I’ve shunned Pinterest for the longest time. It was simply too awesome. Every time one of my Facebook friends pin something, it shows up on my Facebook newsfeed. I click a picture and realize an hour later later that I’m was STILL on Pinterest, looking at stuff that makes me think, “Why didn’t I think of that?” My aunt poked, prodded, pressured, and I resisted. For months. I was determined to not fall into the black hole that is Pinterest. 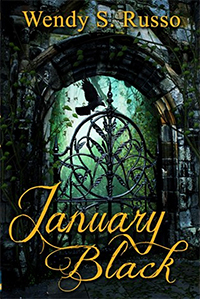 Then, a professional review site called “Reader’s Favorite” notified me that their review of January Black was complete and that it was posted on their site, Goodreads, Facebook, and Pinterest. They also gave me the option of putting all of my social media links on my author page on their site. 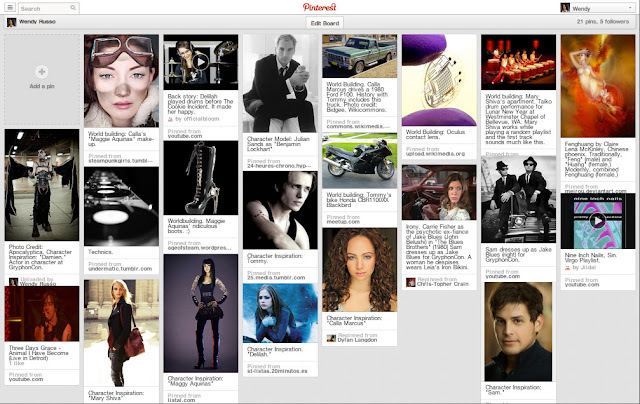 There was an option for Pinterest, but I didn’t have a link, so I joined in a “what the heck” moment. It’s been a revelation. A time sink, yes, but an incredibly useful one. I have Pinterest apps on my iPad and phone now, so I can pin wherever I am…on the couch, at my son’s baseball practice, in the car on the way to work. I see something that catches my eye, I assign it to a board I’ve created for one of my works-in-progress and move along. I thought it was an efficient way of collecting character models and songs for my playlist, and my plan has been to go back to the board and look at the pins for guidance, on characters, locations, and world building elements. This morning, though, I observed something unexpected on my Virgo board. If you’ve ever taken an art class, you’ve likely heard the word gestalt. It’s German, and it implies “wholeness” or the sum of a thing being greater than the total of its parts. When I look at this board, I no longer see individual pins. Through scattered snapshots, the world of Virgo is taking shape. The colors. The people. The sound. I’ve never had such a clear visual of the world I was building so early in the writing process, and even when I’m frustrated with frequent bouts of writer’s block, I’m excited about the story when I’m looking at it. It’s become motivation as well as inspiration. My writing process has evolved again, as this step is quickly becoming one I’d consider indispensible. It’s funny. A month ago, I was annoyed at myself for breaking down and joining Pinterest. I’m now annoyed at myself for not joining years ago. And there you have it....Wendy S. Russo, bringing her writing world to life through the visual awesomeness of Pinterest. Thanks for sharing your techniques, tools, and transition from pantster to plotter, Wendy! Blog Tour Giveaway $25 Amazon Gift Card or Paypal Cash Ends 5/8/13 Open only to those who can legally enter, receive and use an Amazon.com Gift Code or Paypal Cash. Winning Entry will be verified prior to prize being awarded. No purchase necessary. You must be 18 or older to enter or have your parent enter for you. The winner will be chosen by rafflecopter and announced here as well as emailed and will have 48 hours to respond or a new winner will be chosen. This giveaway is in no way associated with Facebook, Twitter, Rafflecopter or any other entity unless otherwise specified. The number of eligible entries received determines the odds of winning. Giveaway was organized by Kathy from I Am A Reader, Not A Writer http://iamareader.com and sponsored by the author. VOID WHERE PROHIBITED BY LAW.